loomis recently noticed that my Seven Rules of Knight Endings was missing the important situation of blocked pawns. This post corrects that. Knights should defend passed pawns from behind, as that often makes them immune from capture by the enemy king. This is easy to grasp visually. 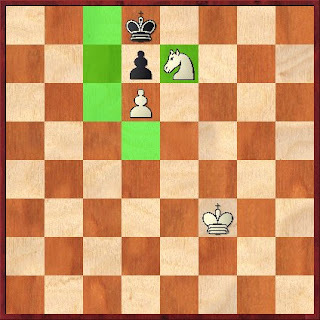 The f5 knight defends the pawn, and Black can't capture the knight without leaving the square of the pawn. White wins! Add a pawn to d7 and the position changes completely. 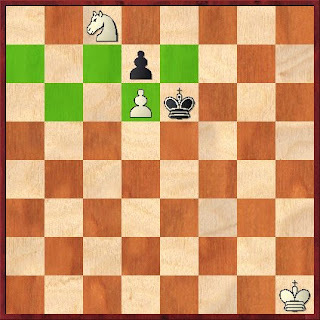 The pawn can't advance when Black captures the knight. Black to move wins! 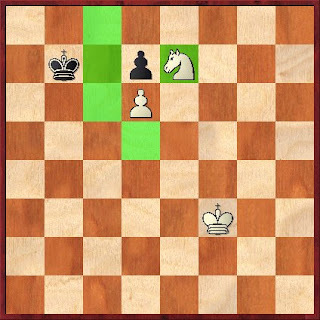 How should a knight defend a blocked pawn? The surprising answer is, from in front. 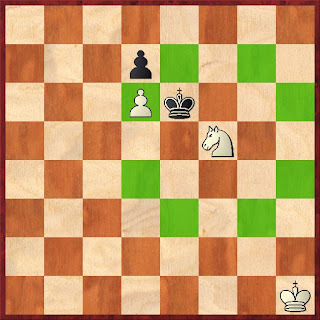 Black would love to play Kd7, forking White's knight and pawn to secure a draw, but his own pawn gets in the way. He could try to draw by threatening the knight. But 1... Kd5 2. Kg2 Kc6 3. Kf3 Kb7 4. Ne7! gets Black nowhere. The knight is happy to hop between c8 and e7 until the White king arrives. 1... Kf7 2. Kg2 Ke8 3. Kf3 Kd8 4. Ne7! is equally fruitless. The White king will soon arrive to queen the pawn no matter what Black tries. 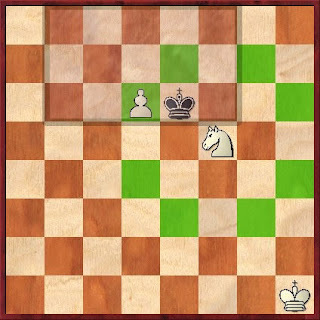 Knights should defend passed pawns from behind, and blocked pawns from in front (on an adjacent file) so they're immune to capture by the enemy king.